In How to Talk About Technology with Younger Children, we covered having “The Tech Talk” with kids from toddler thru elementary school ages. Since the conversation around technology needs to start with our kids as early as two and go well into college and beyond, it was a lot of territory to cover in just one post. So, we split it into two and now we’ll move on to How to Have the Tech Talk with Tweens and Teens. The discussion gets more difficult at this point as touchier subjects come into play, and we have less direct supervision of our children as they become more independent. However, these reasons make your involvement even more crucial and you should not shy away from tackling the tough issues, setting clear rules and enforcing strict consequences when they aren’t followed. The stakes are higher now, both in terms of your child’s safety and their future. One bad decision, such as sharing an inappropriate picture, can follow them in cyberspace for the rest of their lives. Social networks either require or strongly suggest that users should be 13 or older before signing up. However, this won’t keep a large number of tweens from being active on social media anyway. Ask your child if any of their friends are on Facebook or Instagram? Find out what kinds of things their friends are sharing on these networks? Then ask your child what they think is or isn’t okay to share? Now (yes, now!) is when you must begin to broach the topic of using sexual language or posting sexual pictures online or via text and the potential damage it can cause both in the short and long-term. If you need to, give examples of young celebrities they might be aware of who have suffered the damage of such choices. If your child has a phone, you also need to be aware of what apps they are using. Many apps can be used by sexual predators to seek out potential victims. For this reason alone, any app on your child’s phone should be pre-approved by you. All phones come with the ability to set restrictions that will only allow downloading with a password. You should be the gatekeeper of that password. If you are unsure about any app, Google it, you’ll find out really quick whether it’s good or bad. One of the most unfortunate aspects of today’s technology is that it gives many people a false sense of anonymity. As this age group is already prone to a certain amount of teasing and ostracizing, cyberbullying has become a disturbing trend. In worse case scenarios, it has resulted in some children choosing to take their own lives. Keep an open dialogue going with your child on this subject and be sure to inquire if they’ve seen other children treated unkindly. How did this make them feel? How would they feel it was them? Also, while it is normal for tweens to be moody and somewhat withdrawn, be watchful for dramatic or unhealthy behavior changes, as it could be an indication that they are being bullied. At this point, they are old enough to legitimately open social media accounts. 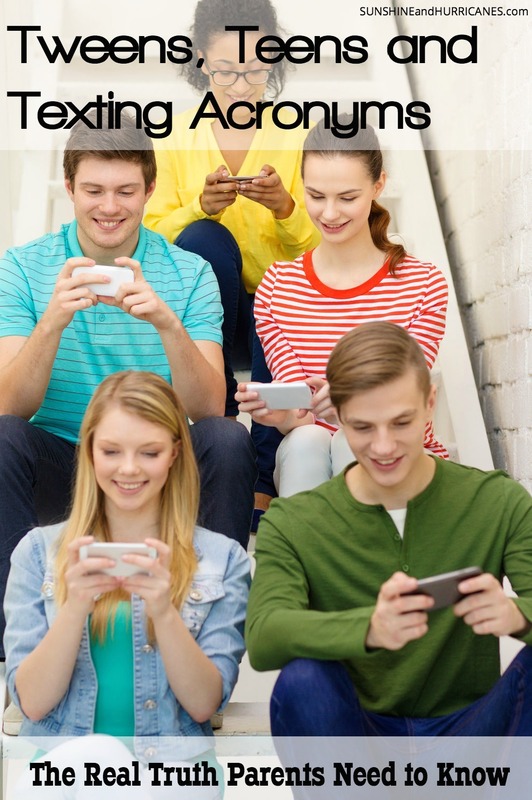 While some parents may still be tempted to forbid their teens from being on social media, you’re going to have to let go on this one, at least gradually. Teens need to learn to navigate this tech terrain and they will require your oversight to help them become responsible social media users. They are also going to need your support in managing the ways social media can affect their self-esteem. Start with one social media platform and monitor their interactions. Remind them that most people only put their best selves forward on social media and so they should be careful about comparing themselves to what they see. Also, if it really poses a problem, help them evaluate whether or not they are really suited to certain types of social media. It can be helpful to share any of your own struggles on these fronts as well, so they see that it is a problem even for adults. If you’ve had technology talks with them starting early, the foundation for this should be well established. However, it is still important to reinforce the importance of being kind and respectful online. 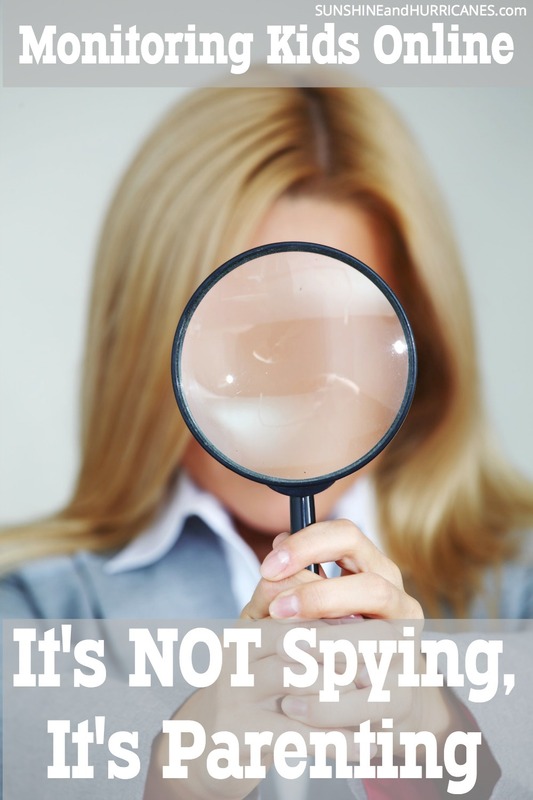 At this age too, you need to make sure that if they see something going on online that makes them uncomfortable and that they feel is morally wrong, they need to come to you. Tell them that they are growing up and you are proud of them, but that sometimes they still need the adults in their lives to help them out and that’s okay. Teens by nature live very much in the moment and it is hard for them to think about how their actions today could impact them five or ten years in the future. However, as they get ready to go to college and then after that to pursue a career, they face a risk that didn’t exist for their parent’s generation. They have an online footprint that is almost impossible to erase. Colleges, perspective employers and even some day their own children will be able to access their entire digital history both written and in images. Ask them if anything you’ve ever posted has embarrassed them? Have them imagine themselves in an interview for a job and being asked about something they posted online? The less you make it a lecture and the more you provide relatable examples for them, the better they will be able to process the long term consequences of their teen tech choices. This is by no means an exhaustive list of all the issues you will face raising children with today’s technology. However, it should give you the necessary tools to be ahead of the game. We’ll continue to cover specific areas in depths in future columns. Sign up HERE to receive our weekly e-newsletters so you don’t miss out! 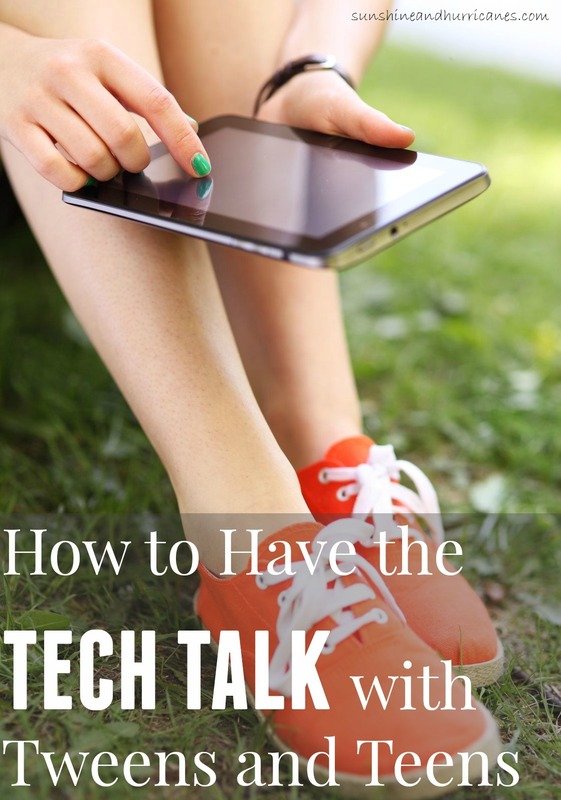 Have you had the Tech Talk with your tweens and teens? If so, what pointers would you give other parents? What topic are you most afraid of discussing? Way to use the internet to help people solve prblsemo! These are great tips for parents! Thanks for sharing. I agree with Debi…great info! It is so sad though that technology has become another way for kids to be bullied or made to feel inadequate! We don’t have children, so I guess I never thought about it, but this is super important! And probably even more uncomfortable than the birds and the bees talk. These are great ideas! I am not looking forward to when my kids are old enough that I have to talk to them about these things. Especially because I’m sure it’s just going to get worse! What an important conversation! I think it’s something that all families need to do just so they can be aware of how their kids are acting! This is so, so important to keep on top of. We’ve had an issue with one of my teen’s classmates sending her inappropriate texts. But, we’ve been on top of it early and it was stopped. Now, we have a continuous open dialogue with her about internet safety. Our tween is not on social media yet, but he is finally starting to text his friends, and we’ve already started the conversation with him. This is some much needed, great information. Thanks for sharing! Great information that all parents need to think about in this age of technology! Great tips! Thanks so much for sharing. You can never be too careful! Great info, Kira! It is so important for parents to be as informed and prepared as possible before allowing their children to have internet/texting access. I’ll be sure to pass this along to my friends and family with teen/tween aged children! Excellent post on a really important topic! It’s really tough, because technology is a great thing, but it also brings many worries for over-sharing and privacy concerns as a parent. Sometimes, I think even parents need to be reminded not to share too much. The internet is a big place. for locals, the recent news of BVHS students posting inappropriate pictures can be the real life lesson example. You can look it up on the NBC-2 website I believe. It was freshman, 14-15 yr olds. This talk cannot come early enough. Parents cannot hide from this issue. They must be proactive early. Great job Michelle and Kira again!! I’m nowhere near having a tween or a teen but these are great tips regardless, will pass on to my sister-in-law who has a nine year old!